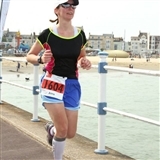 Anna is a Health & Wellness Coach & England Athletics' Coach in Running Fitness. In her own training these days she focuses on running, but in the past she used to race triathlons too (from sprint to half ironman distance). As a running coach Anna focuses on varied sessions that are enjoyable and make the participants want to come back for more! The extra benefit you get from training with Anna is that you can always ask her a question related not only to running but also to a healthy diet and lifestyle and as a health & wellness coach she's always happy to give you some tips, recommend an inspiring film or an informative book on the matter which you're interested in.